For the past 9 months I have been blessed with the opportunity to photograph some amazing events and therapy sessions with Hand in Paw. If you haven't heard of Hand in Paw you should definitely look them up! Hand in Paw is an organization that sends out Animal-Assisted Therapy teams all over Birmingham to aid in improving the health and overall well-being of all they encounter. Teams with dogs, cats and even goats visit different hospitals, schools and corporate offices around the city. While photographing numerous visits and events with Hand in Paw I have gotten to witness first hand how these teams are able to bring overwhelming joy and love to all they meet. I feel so honored that I get the chance to witness and photograph the amazing work this organization does. Sometimes it is so hard for me to express in words just how much something means to me and how much I am affected by something wonderful. This is when I am glad to be a photographer, because I feel like my images tend to say what I can't. Teams go to Children's Hospital and read with the children. These kids light up when they see the Hand in Paw teams walking down the hall! This is Buddy, he loves sweet kids and being read to! This is Jed, he is Hand in Paw director Laura Cardwell's amazing dog. Jed is so well mannered and calm that you can help but love him! This group went to a corporate office in downtown Birmingham to allow workers to have a break and bring a smile to their faces. Imagine being in your office all day and when you go to take a break you get to go love on some sweet pups! That would absolutely brighten my day! This is Melannie and her therapy dog Gracie (far right) and two of her other sweet pups. Melannie and Gracie are an amazing team. Gracie is actually blind and deaf, Melannie uses touch and signs for commands. Mike (far left) was Melannie's first therapy dog, he is deaf but is also trained to know sign language. Melannie and her family love these amazing dogs so much and were able to give them a home when they normally would not have been given that chance. Now these dogs are giving back by sharing their love as Hand in Paw therapy teams. Spring means Mutt Strutt for Hand in Paw! Every year Hand in Paw hosts a dog friendly 5K and 1 mile fun run. Prizes are given out for race winners, dog teams, costumes and more. This is such a fun day in downtown Birmingham and there is even an after party at Good People brewery! Even if you're not a runner it is a fun chance to bring your dog and enjoy the outdoors, the 1 mile fun run is great for families with young children or even pups that don't usually enjoy a long run. 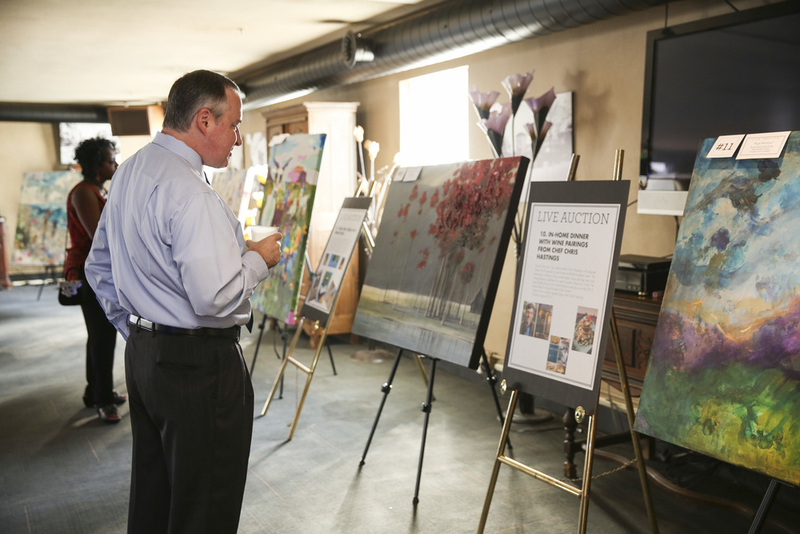 Hand in Paw's biggest fund raiser every year is their Picasso Pets event. Pets are paired with local artists to create one of a kind masterpieces that are put up for live auction at the event. Here are some behind the scenes images from the painting sessions. Of course I couldn't show off the paint sessions without sharing moments from the actual event! Can you believe these paintings once they are finished!?!? Amazing! The Picasso Pets event is an amazing example of how awesome this Hand in Paw group really is and it is a true testament to how much the community loves what they do.